March is National Nutrition Month, making it a great time to zero in on eating habits. This is an area I’m passionate about. In fact, I feel so strongly about good nutrition, that not only do I make sure my family and I eat well, but I also serve as a Board Member for Life Time Foundation, an organization whose mission is to partner with schools to ensure that kids have access to healthy, nutritious food in their school lunches. Life Time Foundation has identified seven harmful ingredients that are commonly found in American pantries and in the cafeterias of our schools. Many of these ingredients have been banned in Europe, Australia, Canada and China, but are still allowed in the US. Eating processed, artificial and unhealthy foods negatively impacts our health in many ways. Not only do harmful ingredients not provide fuel for your body and mind, but they have been proven to cause all kinds of health ailments from obesity, cancer, anxiety, heart disease, diabetes and others. Making changes to eating habits can be hard! It requires letting go of foods that maybe taste good (junk food!) and adjusting your shopping and cooking habits. The change is worth it! Fueling your body with whole foods, clean ingredients and eliminating harmful additives will boost energy and reduces risk of many health issues. According to the Mayo Clinic trans fat is considered by many doctors to be the worst type of fat you can eat. Unlike other dietary fats, trans fat — also called trans-fatty acids — both raises your LDL (“bad”) cholesterol and lowers your HDL (“good”) cholesterol. Trans fats are created through an industrial process in which hydrogen is added to oil, giving it a longer shelf life before it spoils. As you’re adding that grocery item in your shopping cart, pause to check the ingredient label. In the US, if a food product has less than 0.5 grams of trans fat per serving, food manufacturers are not required to add it to the nutrition facts (so they are allowed to list 0 grams of trans fat in nutrition facts). This hidden trans fat adds up quickly – so to be safe, read the entire ingredient list and do not buy if the list contains partially hydrogenated oil or hydrogenated oil. High-fructose corn syrup is an artificially made sweetener that utilizes corn syrup. It’s very inexpensive, so it’s a favorite for food manufacturers who are looking to cut costs. Many experts state that this ingredient is a key factor in today’s obesity epidemic and is linked to other serious health issues, including diabetes and heart disease. Researchers say that the main reason this processed sweetener is so unhealthy is because of the large amount of fructose it supplies your body. The liver is the only organ that can metabolize large amounts of fructose and when the liver gets overloaded, it converts the fructose to fat. High fructose consumption is linked to insulin resistance, metabolic syndrome, obesity, and type 2 diabetes. Other artificial sweeteners include aspartame, sucralose, saccharin and acesulfame potassium. When shopping for foods, you’ll find high-fructose corn syrup in everything from breakfast cereal, to ketchup, juices, soft drinks, sweetened yogurt, granola bars, and even salad dressing. I could keep listing foods in which I’ve found high-fructose corn syrup and artificial sweeteners … they’re in everything! So just like with hydrogenated oils, check the ingredient label and if the food item contains these ingredients (in any amount) don’t buy it. The National Center for Biotechnology Information has a great publication called “Artificial Food Dye Blues” authored by Carol Potera that points out that the FDA has been approached to ban artificial food dyes because of their connection to behavioral problems in children. Research has linked artificial dyes to hypersensitivity reactions and determined that these dyes are inadequately tested. Artificial dyes are often derived from petroleum by-products or coal tar and are found in thousands of foods. In particular, they’re found in breakfast cereals, candy, snacks, beverages, vitamins, and other foods, especially aimed at children. . They’re used to brighten and improve the appearance of foods, but are completely unnecessary. When shopping, check the ingredient labels to for Blue 1, Red 40, Yellow 5, Yellow 6 and Red 3 (or it may be labeled as artificial color). 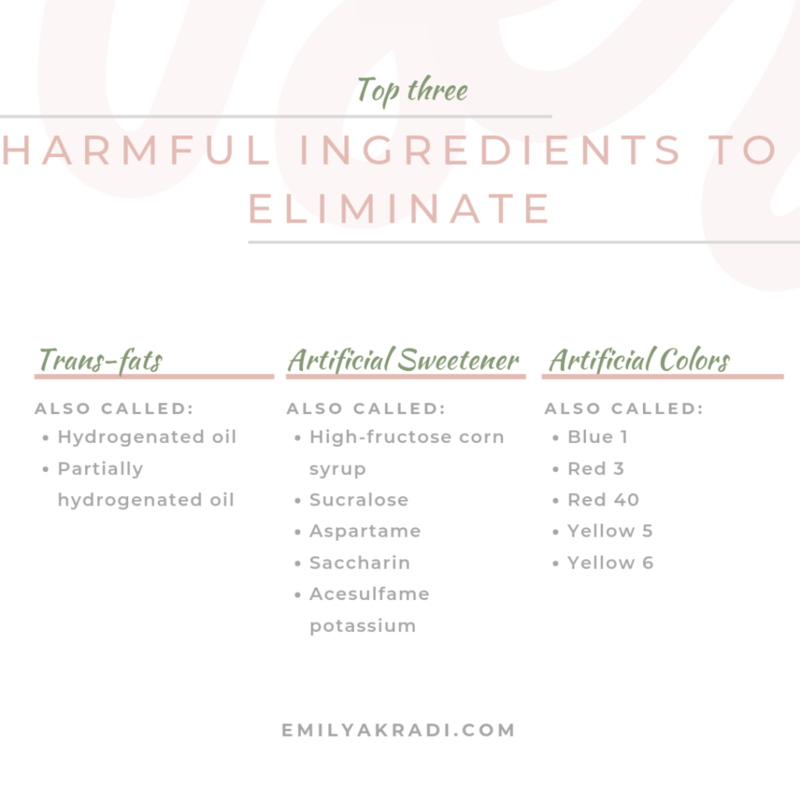 Keep in mind that food dyes are found primarily in processed foods, which you are probably avoiding by the time you get to this ingredient anyway (if you’ve already stopped buying foods that contain artificial sweeteners and trans-fats). Buying fruits and vegetables, organic meats, and other fresh, whole foods will save you a lot of hassle! By shopping the perimeter of most grocery stores, you’re avoiding the aisles that contain most of the processed foods that Americans consume. And when you do want to buy snacks, breads, or other foods, simply get into the habit of checking the label for these three ingredients! As I mentioned earlier, once you’ve identified which foods to avoid, it gets easier. You can simply adjust your buying habits and avoid bringing the unhealthy, processed products into your kitchen! To make it easy for you, I’ve summarized the ingredients mentioned above into a checklist that you can print, screenshot or save** and refer back to when you’re grocery shopping. **On an iPhone, tap image and hold to save.